The flavor of this cake was German Chocolate with the traditional coconut pecan filling. This was a fun cake to make and it was supposed to look like the snowboarder wiped out in some deep snow. Fondant covered 50th birthday cupcakes. Another example of cupcake possibilities. I made these party favors for one of my customers. She gave one to each of the guests at the party. 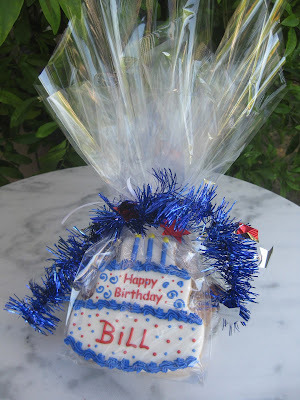 Behind the cookie, wrapped in cello is a star shaped candy dish filled with peanut brittle. As you can see we decided upon a red, white, and blue theme. This cake was done for a bridal shower with an afternoon tea theme. That gave me the inspiration to make a lace tablecloth for the top of the cake. I embossed the corners and highlighted them with luster dust, then "picot" the edges with royal icing string work. The border was made by cutting out individual flowers and scrunching them to give a ruffle look. Flavor of the cake is Chocolate Cake with a layer of Crunch and Ganache and two layers of Chocolate Mousse.